Bad characters in HTML in MS FrontPage. On UNIX-like systems there are a number of different types of 'file' that can exist. One of these is the 'named pipe' or FIFO (First In: First Out). As you can see from the screenshot on the right, they are zero-length and have permissions just like any file or directory. You can set the permissions in the usual way - you can see that I have made mine rw-rw----. The tiny Perl program on the right will take whatever you type in, open the pipe using '+<' as the opening mode and print it to the pipe. If you happen to be running the program on the right in another shell, then it takes what has just been written to the pipe and prints it to STDOUT (the screen usually). By using '+<', you can have this program monitoring the pipe continuously (as a daemon) and have many other programs write to it. 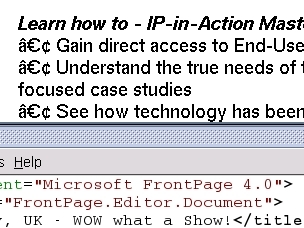 If you were to use '>>' (append and write) as the opening mode on the writing program, then the writing program would not exit until either it was sent a signal (such as [Ctrl][C] from the shell) in which case the contents of the pipe would be lost; or, until a reading program came along and read the contents of the pipe. With '>>' in the write program, pressing [Ctrl][D] breaks out of the 'while' loop but the program doesn't exit until the pipe is read. With '+<' in the write program, pressing [Ctrl][D] also breaks out of the 'while' loop but the program exits without the pipe being read - even if you invoke the reader program afterwards. So, if you want a program to run all of the time, monitoring the use of the pipe, you shouldn't have any problems. If you want to be able to send data to a pipe but then not lock up until the pipe is read, use '+<'. You can, of course, use an alarm to break out of a locked up pipe so that you don't end up with loads of zombie-like programs sitting around, waiting for something to come along and listen to them. This is an example of the two programs included in this directory here as a tar.gz file working together. 'snd' sends messages to the pipe ('cu') and 'rcv' receives them and displays them. as far as I know, Windows doesn't support pipes anyway. If you are running your own personal firewall - or any type of firewall for that matter - you need to know (as opposed to being just complacent about it) that your firewall will block off all external attempts to open connections with your computer. Apart from the ones that you want, of course. 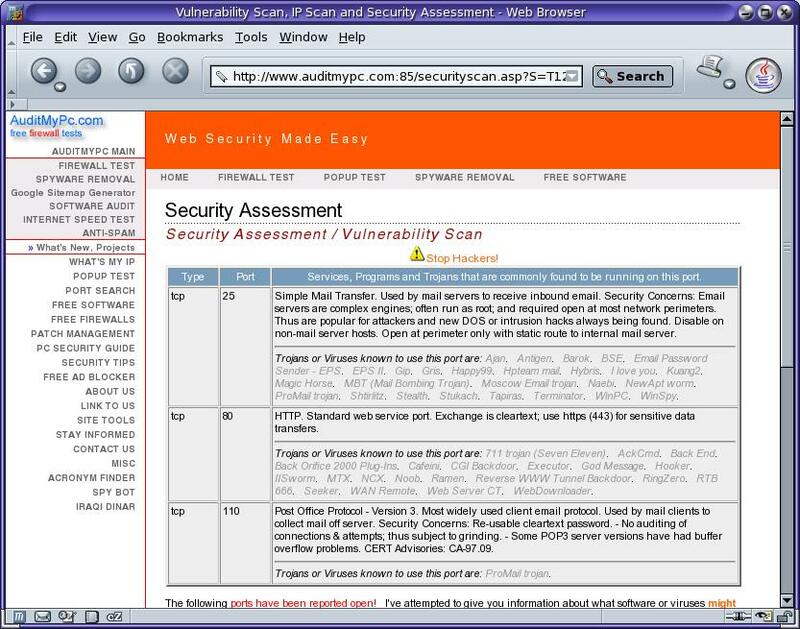 There are a number of sites that will scan your firewall for vulnerabilities for free - sending you a web page with the results on it when it has finished. This one is AuditMyPC.com (http://www.auditmypc.com/) and, as you can see, it has discovered that there are three ports open on this firewall (a hardware firewall/router) on ports 25 (SMTP) 80 (HTTP) and 110 (POP3) - in this case, they are supposed to be open. Click on the image on the right to see the screenshot full sized. 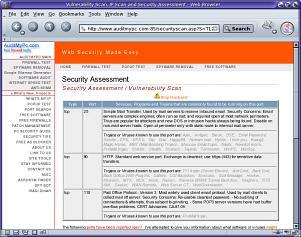 The browser was Mozilla running on Solaris 10 going through two firewalls. We often see puzzles with estimates of the amount of time that it would take for a person to complete it, but how can this be worked out automatically? Usually, with programs that create puzzles, there are a number of algorithms that allow you to make progress in solving the puzzle. Ideally, these each replicate some part of the process that the human puzzle solver will do and therefore take up time. It is fairly easy to count up how many of these uses of various algorithms take place for a particular puzzle and these numbers can be recorded. To calibrate these numbers so that a human-meaningful result is produced, a human needs to do these puzzles. 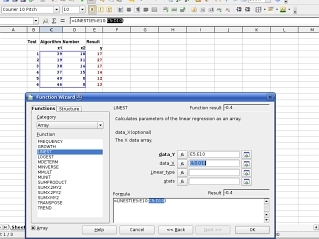 So, we end up with a load of numbers representing algorithm usage and some times but how does that give us factors that we can put in a computer program? how do we get to say something along the lines of 'the time in minutes equals a constant plus some algorithm use multiplied by a factor plus some other algorithm-use multiplied by another factor' and so on? After all, we don't have a situation where, for each time, only one of the algorithms was used. We'll use OpenOffice.org's spreadsheet 'Calc' because it: is good quality; has good functionality; does everything that 99.9 percent of the spreadsheet user population needs a spreadsheet to do; is cross-platform; and, is free. First of all, type in your results. You'll need an absolute minimum of one result set for each variable plus one. However, the more the better - although with something like puzzle-solving, you must remember that the later puzzles you solve will be as a higher-level player than those that you started off with as you will have had a lot of practice. Once you've typed in your results, move the cursor (the current cell) to where you want your results to go and then click on the 'Function Wizard' button. 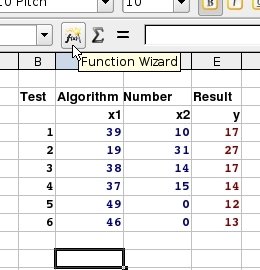 Next, the Function Wizard opens and you are presented with a list on the left of functions and categories. 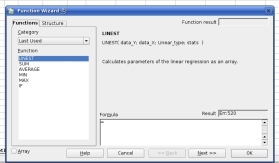 You need to choose 'LINEST'. If you select the 'All' category, you will find it but otherwise, it lurks under the 'Array' category (its output is in the form of an array) or, if you have used it recently, if you click on the category dropdown list and move to the top, you will see the 'Last Used' category which can be very helpful. 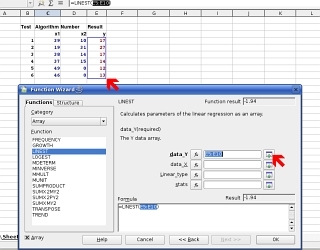 This is the format of the LINEST function. Instead of typing in the data directly into the cell, I would recommend using the wizard. Next, click on 'Next >>'. This is the dialogue box that appears next. In the top field, you need to input the dependent variables (the time results from your experiments in this case as they are dependent on the puzzle produced and solved by your program. You can, as in the screenshot, just drag the mouse over the results column but if you are a little short on screen real-estate, you can click on the button that the lower of the two red arrows is pointing at. This will roll up the dialogue box allowing you to see the screen. Note that the dialogue box does not disappear completely and that there is a similar button on the right of the new box - just press that and the dialogue box returns to its full size. 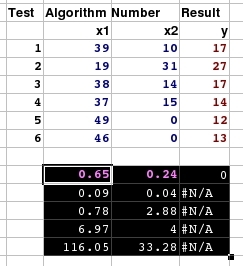 Next, repeat this with the independent variables (your algorithm counts). Next, you have to decided whether it wants to calculate your factors so that the best fit goes through the origin or not. If you want it to go through the origin, type zero (0) here, or else, a 1. If you need the accompanying statistics - letting you how good a fit the regression was and so on - then use a 1, else use a 0 if you only want the factors. Now, you have your results. In this case, we have two input variables. 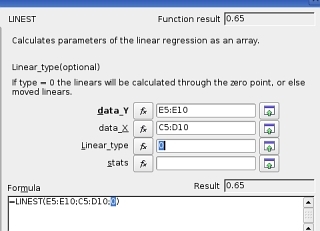 In the results block, the row of numbers at the top (in the case where you have the statistics output as in this case) are the factors. 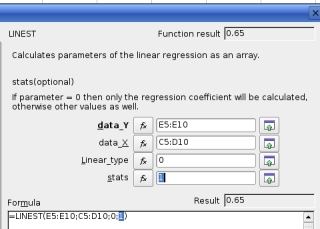 The number at the right is the constant if you decided that the regression should not pass through the origin - otherwise it is zero which effectively means the same thing. The value to its left is the first factor (in this case for column X1) and the value on the left is for the seconds column (X2). In effect, with the offset for the origin on the right, the factors to the left read in reverse order. ... where $t is the scalar variable for time in minutes (or at least the same time units that were used in the tests on the puzzle), $x1 is the number of times that the first algorithm was used in the solution and $x2 is the number of times that the second algorithm was used in the solution. If you were using the origin offset, that would go in there instead of the zero which is only shown here for the sake of completeness. The image on the right is a finished Kakuro (cross-sum) from my Perl program. 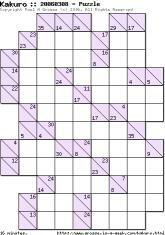 Kakuro's first appeared as cross-sums in the USA decades ago but were made popular by Nikoli who invented the term 'Kakuro' (as opposed to the puzzle). At the bottom left, you can see the estimate of the time it would take for someone to complete it. If you click on the image, the full-sized version will appear in a new browser window. You can print it out and have a go at solving it. If you don't know the rules: it is like a crossword with across and down clues - these are the numbers that are in fact the total of each digit in a particular sum; each sum cannot have any number repeated, only the numbers 1 to 9 inclusive may be used in any once cell. This means that for a sum of 17 in 2 cells, only 8 and 9 can appear. Likewise, for a sum of 16 in 2 cells, only 7 and 9 can appear. So, where 16 and 17 as two, two-cell sums intersect, only the number 9 is in common, therefore a nine appears at the intersection and other numbers are deduced logically or mathematically. Whilst some maths that a six-year-old could do does crop up, almost all of the puzzle is solved by logical deduction and elimination. You can test the responsiveness of your ISP's web server just by pinging it. However, if you are paying for a particular bandwidth, how do you know if you are getting it? run another program that processes the database that you have created with your monitoring program. So, first of all, upload a large(ish) file - maybe around 500kB - to your ISP's web server. This will give your monitoring program enough of a chance to get a stable reading during the process. The first law of analysis is that an inadequate sample cannot give meaningful results. Next, you need to install Perl and the GD library. On Linux/BSD/UNIX systems, this should be part of the distribution (certainly Perl itself is) but if you cannot find the GD library, you can install it from CPAN. If you find that you cannot get GD for your system you can always tweak the program so that it outputs a graph in the form of an HTML page. Also, you need to install WGET - again, this should be part of your distribution or you can download it from the Internet. All of these work on Linux and should work on Windows. After that, click here to open the directory with the files in it in another browser window. Create a directory in your home directory and copy the files from the /home directory in the browser window into your new directory. Create a directory in your server directory (possibly called 'bbspeed' or similar) and copy the files from the /server directory into that. In your server config file (httpd.conf or similar) you might want to make that directory password protected or even put it in another directory (one that is not within the confines of the server root) if you aren't going to need to look at it from anywhere other than the local machine. Next, open the Perl script files and edit any paths that need it, to the ones that you have on your machine (really, just where you have put these files) and then there is only one thing left to do. Finally, open up the crontab file in /etc and copy the lines from the /crontabfrag/crontab.frag file into it - changing any paths as required. If you have done everything correctly, you should get a picture like the one on the right (click on it to open it in a new browser window/tab). The World-Wide Web has minimum standards that everybody really should adhere to if they want their websites to work properly with the audience that they are aiming at. I'm not talking about using the right tags here, I'm talking about using characters that are likely to be found in the fonts used by people's browsers. On the right, you can see how some characters have been used that do not appear in the browser's character set for the default font that is being used - why should someone who is building a web page assume that everybody who is important enough will have the same set of fonts that the designer does? The font used in the screenshot is Adobe Helvetica so it is not as though this is with some shoddy, couldn't-be-bothered font that is missing all of the 'important' characters including the tags. The real problem with this web page is that it is encoded in 'Unicode utf8' although there is no mention of this anywhere in the document. The section of text at the top is a bulleted list but instead of using the normal <ul><li>Gain direct...</li>...<ul> type tags which provides a nice looking, neat list, they have used line-breaks and special characters. Clearly, using a centred bullet point that requires the user to use an encoding that is not mentioned anywhere in the document and also failing to use the standard method of creating bulleted lists is very poor. And the culprit? 'Microsoft FrontPage 4.0' apparently.